Moving a Relative & Other Transitions in Dementia Care is an expansion of our original book, Moving a Relative with Memory Loss (2000, 2006). This comprehensive guide is intended to support families from the beginning to the end of the caregiving journey. We are honored to have a panel of experts helping us address many other transitions that families face during the caregiving journey. These include decisions about safety, bringing in home care, preparing for hospitalization and end of life, talking with a relative about giving up driving, moving from out of state and more. A large section of the book is devoted to moving decisions and logistics, incorporating the content of the original book as well as new information. Case studies of real situations are sprinkled throughout the book, along with many practical suggestions. At the end is a comprehensive worksheet to take along with you when you visit residential care homes. As a care partner for someone living with dementia, my life is full. I am grateful to Laurie White and Beth Spencer for Moving a Relative and Other Transitions in Dementia Care, a book that does not read like a text book, but as a guide book. Its easily accessible language, examples of case studies, and links to additional resources allow me to pick and choose information that I might need at a particular moment in time. Change is difficult, takes effort, and oftentimes makes life messier before it makes life better. With this in mind, I am thankful for the snippets of guidance and encouragement provided in this book for help along the way. Every family should receive Moving a Relative and Other Transitions in Dementia Care at the time of a dementia diagnosis. When my husband Bill began his journey with Fronto-Temporal Dementia, the content of this book would have been invaluable. Laurie White and Beth Spencer have provided a complete picture of what to consider, bolstered by case studies and where to go for additional information. All of this is packaged in a user-friendly, easy to digest manner. I definitely recommend it to anyone touched by this disease. 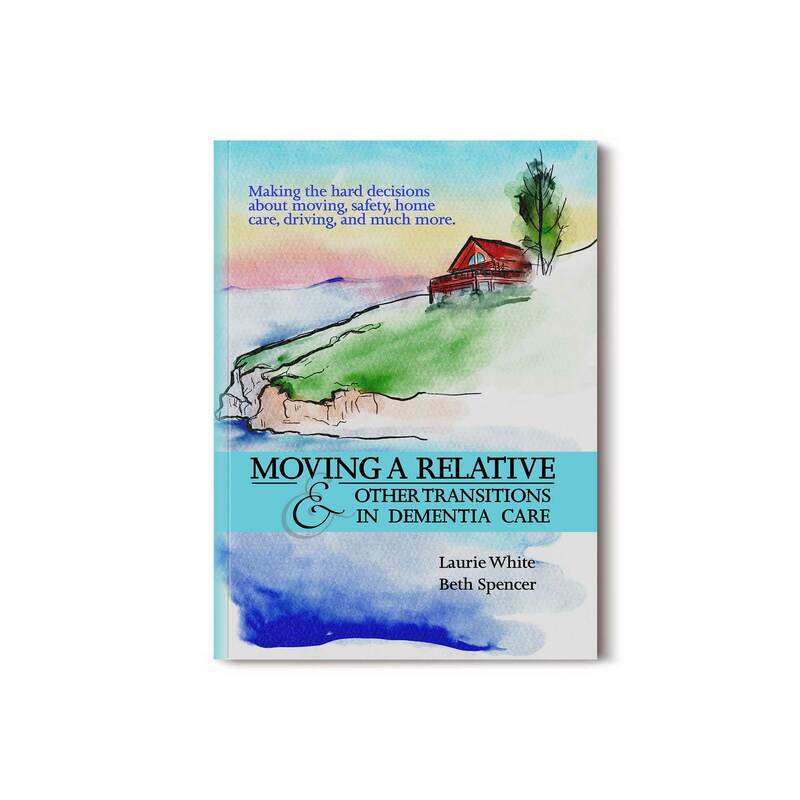 Moving a Relative and Other Transitions in Dementia Care is a well written easy-to-understand book for dementia caregivers. I wish I had this book available to me when I was faced with the decision to place my wife in a memory care residential facility and all the emotions that came along with moving her out of our home. As a caregiver and a support group facilitator for young-onset dementia caregivers, I recommend this book to any caregiver in need of advice for moving their loved one. This guide will help families through a maze of decisions when a loved one must move to a new home. It’s written in simple and practical terms, reflecting the two authors’ long experience with helping families through this difficult process. At some point all care partners face challenging decisions regarding daily life. How do we know when a relative with cognitive changes is no longer safe living alone? What should we do when driving becomes a concern? How do we make the decision to move a parent or a spouse to assisted living or memory care? This new book by Laurie White and Beth Spencer – Transitions in Dementia Care – will help families navigate these hard decisions. As a comprehensive resource, Transitions in Dementia Care will prove invaluable to families as they navigate transitions from the beginning of their caregiving journey to the end of their relative’s life.